When TV shows and feature films are being mixed, the final deliverables usually include audio stems as separate audio files or married to a multi-channel video master file or tape. Stems are the isolated submix channels for dialogue, sound effects and music. These elements are typically called DME (dialogue, music, effects) stems or splits and a multi-channel master file that includes these is usually called a split-track submaster. These isolated tracks are normally at mix level, meaning that you can combine them and the sum should equal the same level and mix as the final composite mixed track. The benefit of having such stems is that you can easily replace elements, like re-recording dialogue in a different language, without having to dive back into the original audio project. The simplest form is to have 3 stereo stem tracks (6 mono tracks) for left and right dialogue, sound effects and music. Obviously, if you have a 5.1 surround mix, you’ll end up with a lot more tracks. There are also other variations for sports or comedy shows. For example, sports shows often isolate the voice-over announcer material from an on-camera dialogue. Comedy shows may isolate the laugh track as a stem. In these cases, rather than 3 stereo DME stems, you might have 4 or more. In other cases, the music and effects stems are combined to end up with a single stereo M&E track (music and effects minus dialogue). Although this is common practice for entertainment programming, it should also be common practice if you work in short films, corporate videos or commercials. Creating such split-track submasters at the time you finish your project can often save your bacon at some point down the line. I ran into this during the past week. A large corporate client needed to replace the music tracks on 11 training videos. These videos were originally editing in 2010 using Final Cut Pro 7 and mixed in Pro Tools. Although it may have been possible to resurrect the old project files, doing so would have been problematic. However, in 2010, I had exported split-track submasters with the final picture and isolated stereo tracks for dialogue, sound effects and music. These have become the new source for our edit – now 6 years later. Since I am editing these in Premiere Pro CC, it is important to also create new split-track submasters, with the revised music tracks, should we ever need to do this again in the future. I’m usually editing in either Final Cut Pro X or Premiere Pro CC these days. It’s easy to generate a multi-channel master file with isolated DME stems in FCP X, by using the Roles function. However, to do this, you need to make sure you properly assign the correct Roles from the get-go. Assuming that you’ve done this for dialogue, sound effects and music Roles on the source clips, then the stems become self-sorting upon export – based on how you route a Role to its corresponding export channel. When it comes to audio editing and mixing, I find Premiere Pro CC’s approach more to my liking. This process is relatively easy in Premiere, too; however, you have to set up a proper sequence designed for this type of audio work. That’s better than trying to sort it out at the end of the line. The first thing you’ll need to do is create a custom preset. By default, sequence presets are configured with a certain number of tracks routed to a stereo master output. This creates a 2-channel file on export. 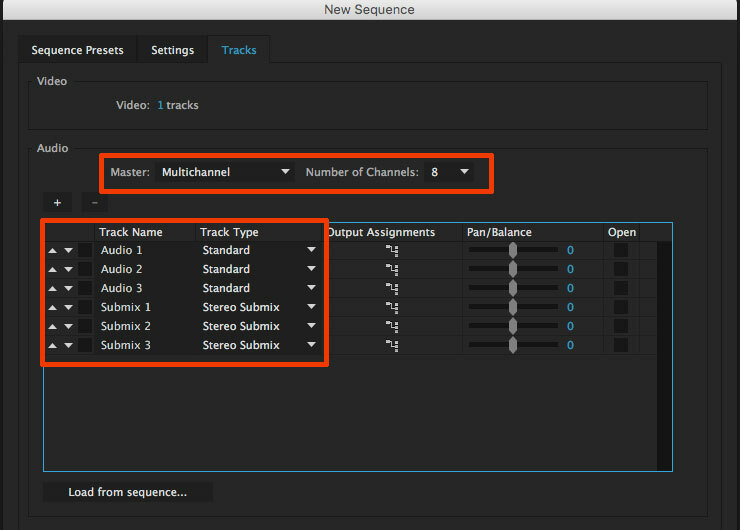 Start by changing the track configuration to multi-channel and set the number of output channels. My requirement is to end up with an 8-channel file that includes a stereo mix, plus stereo stems for isolated dialogue, sound effects and music. Next, add the number of tracks you need and assign them as “standard” for the regular tracks or “stereo submix” for the submix tracks. This is a simple example with 3 regular tracks and 3 submix tracks, because this was a simple project. A more complete project would have more regular tracks, depending on how much overlapping dialogue or sound effects or music you are working with on the timeline. For instance, some editors like to set up “zones” for types of audio. You might decide to have 24 timeline tracks, with 1-8 used for dialogue, 9-18 for sound effects and 17-24 for music. In this case, you would still only need 3 submix tracks for the aggregate of the dialogue, sound effects and music. 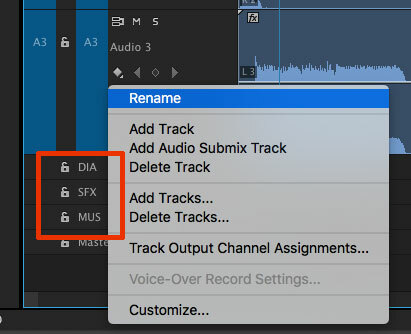 Rename the submix tracks in the timeline. I’ve renamed Submix 1-3 as DIA, SFX and MUS for easy recognition. With Premiere Pro, you can mix audio in several different places, such as the clip mixer or the audio track mixer. Go to the audio track mixer and assign the channel output and routing. (Channel output can also be assigned in the sequence preset panel.) For each of the regular tracks, I’ve set the pulldown for routing to the corresponding submix track. Audio 1 to DIA, Audio 2 to SFX and Audio 3 to MUS. The 3 submix tracks are all routed to the Master output. The last step is to properly assign channel routing. With this sequence preset, master channels 1 and 2 will contain the full mix. 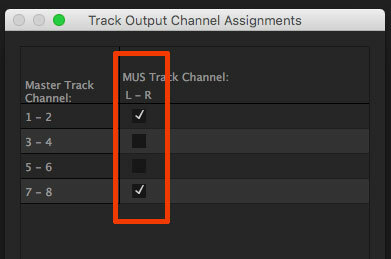 First, when you export a 2-channel file as a master file or a review copy, by default only the first 2 output channels are used. So these will always get the mix without you having to change anything. Second, most of us tend to edit with stereo monitoring systems. Again, output channels 1 and 2 are the default, which means you’ll always be monitoring the full mix, unless you make changes or solo a track. Output channels 3-8 correspond to the stereo stems. Therefore, to enable this to happen automatically, you must assign the channel output in the following configuration: DIA (Submix 1) to 1-2 and 3-4, SFX (Submix 2) to 1-2 and 5-6, and MUS (Submix 3) to 1-2 and 7-8. The result is that everything goes to both the full mix, as well as the isolated stereo channel for each audio component – dialogue, sound effects and music. Once you’ve set up the timeline, the rest is easy. Edit any dialogue clips to track 1, sound effects to track 2 and music to track 3. In a more complex example, like the 24-track timeline I referred to earlier, you’d work in the “zones” that you had organized. If 1-8 are routed to the dialogue submix track, then you would edit dialogue clips only to tracks 1-8. Same for the corresponding sound effects and music tracks. Clips levels can still be adjusted as you normally would. 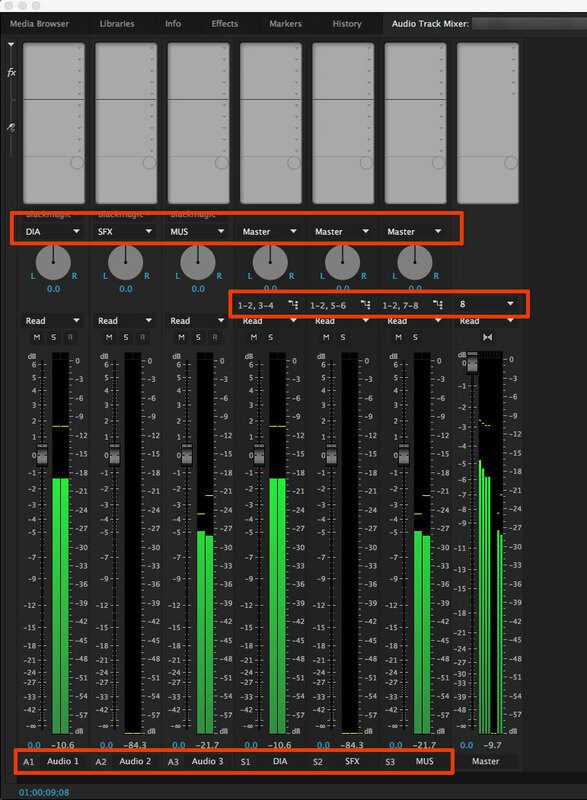 But, by having submix tracks, you can adjust the level of all dialogue by moving the single, DIA submix fader in the audio track mixer. This can also be automated. If you want a common filter, like a compressor, added all of one stem – like a compressor across all sound effects – simply assign it from the pulldown within that submix channel strip. The last step is exporting your spilt-track submaster file. If this isn’t correct, the rest was all for naught. The best formats to use are either a QuickTime ProRes file or one of the MXF OP1a choices. In the audio tab of the export settings panel, change the pulldown channel selection from Stereo to 8 channels. Now each of your timeline output channels will be exported as a separate mono track in the file. These correspond to your 4 stereo mix groups – the full mix plus stems. Now in one single, neat file, you have the final image and mix, along with the isolated stems that can facilitate easy changes down the road. Depending on the nature of the project, you might also want to export versions with and without titles for an extra level of future-proofing. 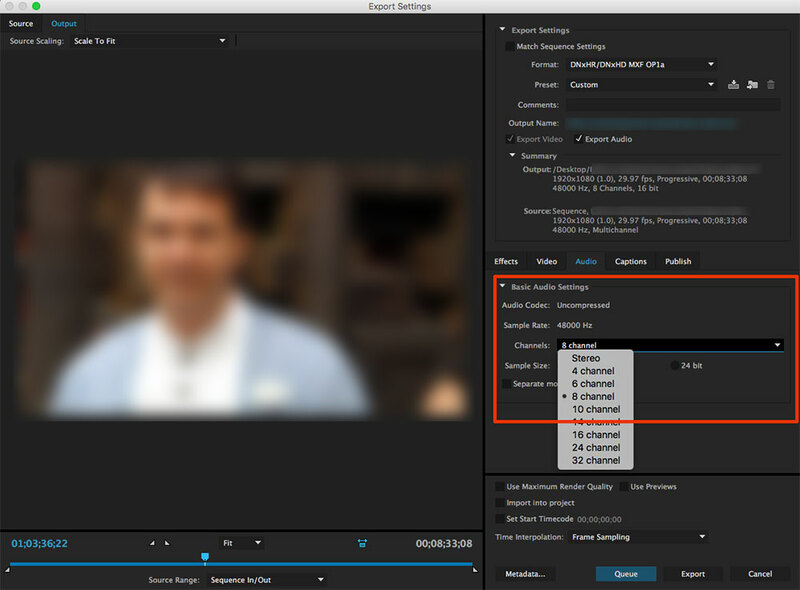 If you decide to use this exported submaster file at a later date as a source clip for a new edit, simply import it into Premiere Pro like any other form of media. However, because its channel structure will be read as 8 mono channels, you will need to modify the file using the Modify-Audio Channels contextual menu (right-click the clip). 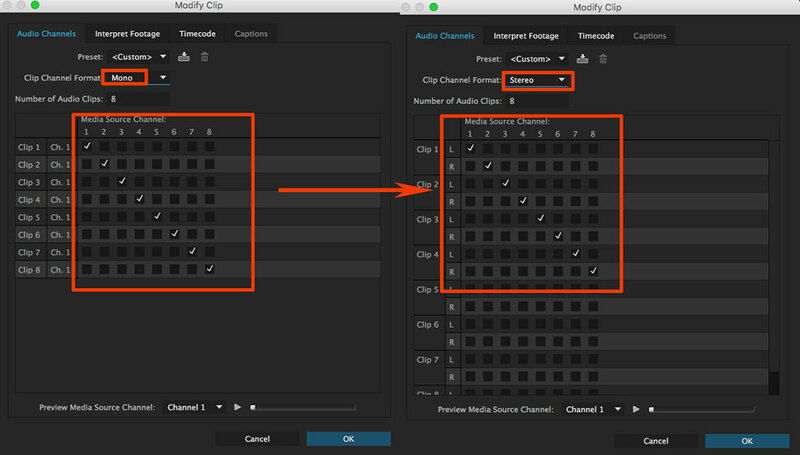 Change the clip channel format from Mono to Stereo, which turns your 8 mono channels back into the left and right sides of 4 stereo channels. You may then ignore the remaining “unassigned” clip channels. Do not change any of the check boxes. Hopefully, by following this guide, you’ll find that creating timelines with stem tracks becomes second nature. It can sure help you years later, as I found out yet again this past week! This entry was posted in audio info, editing, Premiere Pro, tips and tricks, workflows and tagged Adobe, audio, editing, Premiere Pro, workflows.